This book describes all possibilities known to man on how to create red coloured glazes for ceramic application. This book describes all existing possibilities how to create red coloured glazes for ceramic application. Information and recipes are given for the various methods using iron, copper, gold, chromium tin stains, chromium, nickel, uranium and finally cadmium selenium red. For each method the history is described and the main investigations which have been done. Also the most relevant publications (also patents) are mentioned for that particular component. The book is published in paperback format and has 140 pages, 17 tables, 7 figures and 19 photographs in full colour showing typical examples of the red colours as described. Although red is called the colour of activity it is remarkable that the ceramic industry must wait roughly 8000 years before a more general use and application of the so-called pillar box or signal red colour was possible. All known previous and current means of producing red glazes are included. Elements as iron, copper, Cr/Sn stains and even uranium are all--or have been--used in the past. Recipes included. If your hunger for knowledge of red glazes still isn't quenched, a literature list is included for your convenience. The book contains full-colour pictures of many of the applications and colours of red glaze. Scientific tables and diagrams such as the CIE chromatic complete the picture. Packed with know-how you won't find anywhere else. Eight chemical elements, or combinations of them, represent everything known to produce the shades of red we need. Each element is described and illustrated in detail, each featured in a dedicated chapter. The element with many-sided possibilities. A wonderful red due to a ceramic conversion. A ceramic creation of real red colours. Trusted by honest, hard-working people. I have personally worked with the author for many years in Ferro (Holland), before both of us moved on. Leen is an expert in, amongst others Cd/Se-glazes, and one of the main persons responsible for its development at that time. He is gained even more expertise whilst working at other major ceramic materials producing companies since then. Certainly recommended reading from a prominent expert in this subject. Ben zeer benieuwd naar een, vast en zeker, doorwrocht boek over rode glazuren. Ik zal er zeker een paar bestellen. Dear mr. Baay, Your “Red book” is quite good!!! In the last week a I layed on the bed with antibiotics and read-out it down-the-line. Especially Your preparation of the ancient blue copper glaze from “Glassmakers tablet” is very cool! Congratulation!! I have worked with Leen at Johnson Matthey for a number of years. He is acknowledged as an expert in cadmium red glazes and much more. The industrial community have waited for a long time for a book of this nature with a strong scientific and industrial bias. This will become a firm favourite of ceramic engineers worldwide. 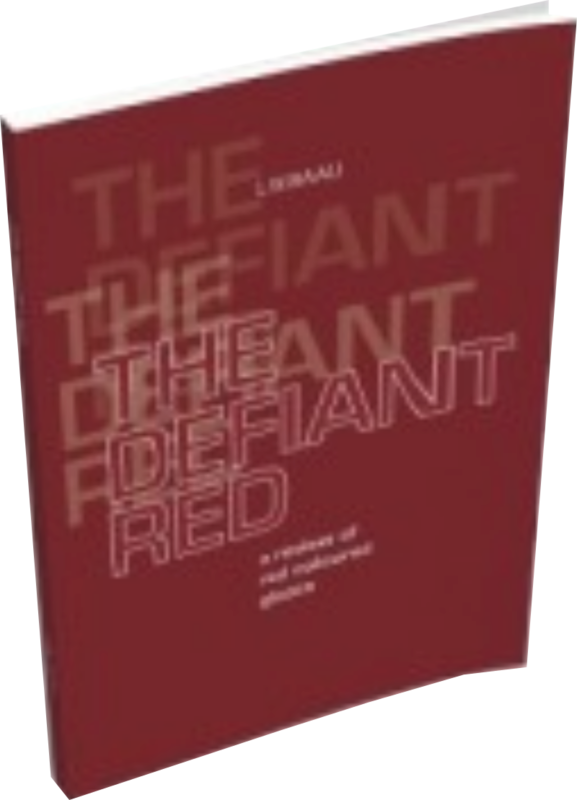 I have a good supply of paperback The Defiant Red books in a box. Click the order button to begin the process of my saying goodbye to one of them. The shipping charges are calculated based on the destination. I have learned to always ship registered. I will send you the tracking code as well. After a chemical education he started working at the chemical laboratory of Ferro (Holland), becoming familiar with silicate analyses and all common raw materials used in the ceramic, glass and porcelain enamel industry. During 21 years he developed a wide range of products for the growing ceramic industry. Especially, he redesigned the formulations for the cadmium.selenium frits and glazes to what they are still today. He joined Drakenfeld Colours (Ciba Geigy) to set up a new plant mainly for the compounding of the black obscuration glass enamels for the automotive industry. Returned to ceramics in 1993 when Drakenfeld Colours and Degussa set up the joint venture Cerdec and the unit in Maastricht was closed. Joined Johnson Matthey in 1993 until retirement, holding senior leadership positions for North and Eastern Europe. If you have any question or remark about this project, get in touch by emailing lwb2@home.nl.